I’ve been on a break. I just kind of checked out from reality and let myself disappear for a few days. No email responses, no daily facebook checks, no blogging…none of my normal routine. I need to get around to reading and responding to all the messages and kind inspirational words that I know are there, but I wanted to make sure I could really absorb them, not just fleetingly glance at them while I was still licking my wounds. I still have a bit of a season left, but I found it difficult to motivate myself to continue on in regular fashion right away. You work so hard to reach this peak, and then all of the sudden you find yourself on the other side of it, and my body and mind are just a bit lethargic. 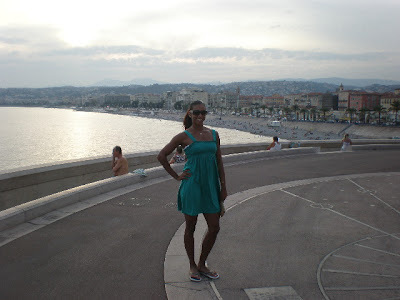 But nobody is paying me to sit on the beach in Nice or walk around the streets of Paris as a full blown tourist, so I’m back on the grind with a few low key meets in Italy that I hope will get the juices flowing again and put me back on track to finish the season strong. My diet of cappuccinos and croissants may have set me back a bit, but it was good for the soul and hopefully my civilian lifestyle didn’t take too much of a toll on my system. Here are a few pictures from my mini break. 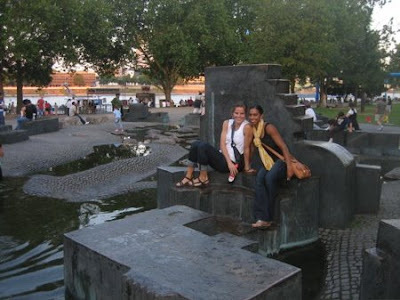 I hung out with my friend Debbie, who had came to Berlin to see me compete and then was spending a little time seeing more of Europe. She let me tag along until I had somewhere else to be. 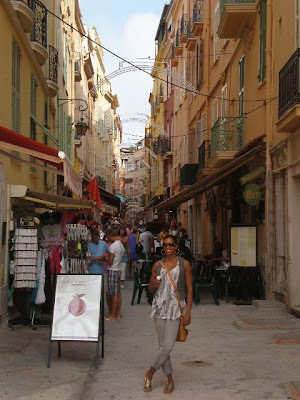 -Me on the streets of Nice. 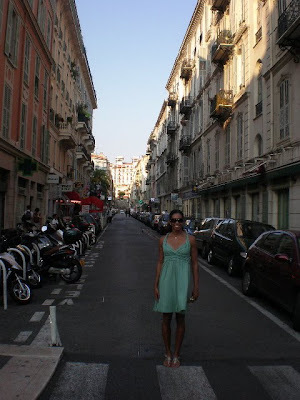 Cities in Europe are just so much cooler than our cities in the States. -Me and the Debster at the beach. -My favorite pastime. Reading a book…on the beach…under an umbrella. Life doesn’t get sweeter. 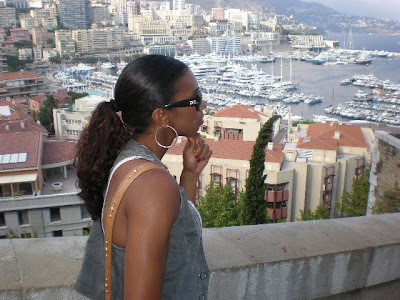 -Looking out over Monaco…contemplating how I can get enough money to live there! 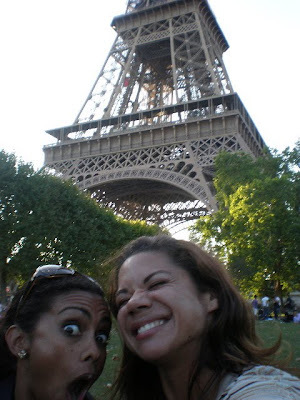 -After all the normal shots of the Eiffel tower, we started getting silly with it. 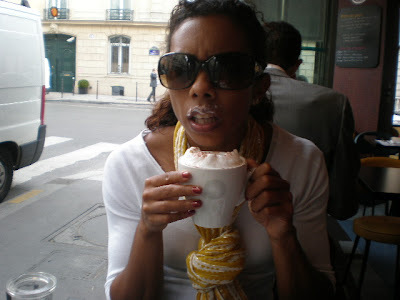 -Realizing the cappuccino is 6 euros!! -Standing in the lobby of our hotel. You never realize when someone might be snapping a picture! You know what’s hard about trying to be the best in the World at something? Trying to be ok with 9th best in the World. It’s not an easy pill to swallow. Not when you know you could do better and not when you know that you should’ve done better. I could also choose to focus on all the positive things I have accomplished this year but that’s a bit difficult for a person like myself. The best I can do is try to make room in my head for both. In my mind I’m thinking, “I’ve jumped 6.80…if I could’ve just done that today I would’ve had a bronze medal!” But that is not what I jumped today unfortunately, and I’m doing my best to keep my head up. That’s what everyone keeps telling me… “Keep your head up, Bri”…followed by some positive statement that I know in my heart is true. For starters, I’m here. I made the final. I did all this after a year when I said I didn’t want to even jump anymore. So I have every reason to hold my head high. But when I do my eyes are still glistening with tears because I know I could’ve done more and I wanted to so badly. But that’s life, and that’s sport, and in both there are lessons to be learned each and every time. I’ll be back. And the next time I’m on the World Stage will be better than this time. There is nothing more I can do than commit to doing more the next time around. In the meantime I’ll just continue to hold my head up high and remind myself that there are a whole lot of people in this world, and out of those there are a handful who consider themselves long jumpers, so to be the 9th best out of all those people really isn’t too shabby. I’m sure most of you know by now, but I have qualified for the Long Jump Final at the World Championships here in Berlin. I am elated. Ecstatic. Overjoyed. Thrilled... I could go on and on, but I will save the rest of the adjectives for Sunday because I plan on needing them. This competition was a test of my belief. My belief in myself, the belief I have in my abilities, the belief that I am truly one of the best Long Jumper’s in the World, and most of all, the belief that I have faith in a God who can do all things. Because when I stood on the back of that runway for my third and final jump, with two fouls on my card and wind and rain blowing in my face, I knew that the only way to make it happen was to truly believe. Hope was not enough. Wishing for the best would not make it happen. Desiring for it to go my way would probably leave me a little bit short. So I took a deep breath and simply believed that I would jump a fair jump and it would be the very best I could do at that moment in time. I don’t want to make the moment seem so fairytale like that it seems as if I’m putting extras on it. If I’d have had it my way, I would have jumped the automatic distance on the first jump and got out of there before the rain even started pouring. But I’ve said it before and I’ll say it again…rarely is our plan, His plan. It doesn’t matter how I got to the final as long as I’m there. I feel like the hardest part of the competition is behind me and now comes the fun part where all I ask of myself is to have fun and give my very best. I believe that the best I give will be something special. I truly believe that. There are many professional athletes that are looked up to or admired for a myriad of reasons. In our society, it’s easy for us to adore someone based on a skill set they possess. But Jesse Owens is someone that should be revered for the person he was, something that goes far beyond what he accomplished as an athlete. As an athlete I realize the importance of those who came before me and paved the way so that I can live my life doing something that I love and am passionate about. 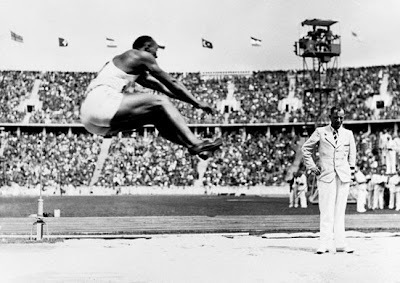 Jesse Owens is one of those people. But his influence goes so far beyond athletics and he is one of those few individuals that could be and should be a hero to everyone. As a team, we are honoring his legacy and his spirit by adorning our uniforms with the letters JO in the upper right hand corner. If we could all take a little bit of his strength and courage with us in competition, it’s sure to be an advantage. Above all though, it’s an honor to be following in his footsteps. ***For those of you who have been watching track all week long and have wondered when the heck women’s long jump is going to make an appearance, we kick off tomorrow evening for the Prelims at 6:15 pm local time. I feel inspired, blessed, and completely ready for the task at hand. I’m excited to get going and expect to be updating with positive results afterwards. Thank you so much for all the thoughts and prayers! Any big event is going to be with its fair share of controversy. That’s just the way things work. The World Championships in Berlin are no different. Today a story has emerged that has the word written all over it. The women’s 800 meter final is tonight and it may or may not go off with this season’s best performer, South Africa’s Caster Semenya in the field. If you’ve been watching closely and happened to have caught the prelim of this event, you may remember she was part of the mix-up that caused the previous World Champion to fall and come in dead last, and herself to come extremely close to taking a bad fall, but somehow managing to save herself and finish the race in 1st. But I’m getting ahead of myself here just a bit…the fact that I’m referring to Semenya as a “she” is the whole reason for the controversy. It seems there has been testing done (or there will be in the near future) to see whether she’s male or both, and therein is where the problem lies. 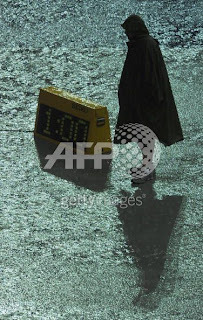 According to IAAF rules, a competitor must be fully female to compete in women’s events. She seemingly came out of nowhere and burst onto the international scene to be the best in the world and that was the first clue that something was amiss. Add to that her running style and mannerisms and people really begin to scratch their head. The fact remains that nothing has been confirmed yet but that of course does not stop tongues from wagging. And if it is true, perhaps she didn’t knowingly try to gain an unfair advantage and figured she wants to live her life as a woman and therefore it wasn’t something she truly thought about when she laced up her spikes. You can see from this interview that she is very new to the sport and comes from an extremely simple background. It could be something that was never even discussed with her teammates and coaches, and now unfortunately it is turning into a global media story. For that, I do feel sorry for her. But it’s hard enough racing against the best females in the world, who wants to also add to the mix those who have extra testosterone and other beneficial male characteristics? So what do you make of the story? It will be horrible if it turned out not to be true, but if it is, I think it wouldn't be fair to let her compete. I guess I feel like the only fair thing that could be done in the future would be to allow them their own category, just as the Paralympians have. But for the immediate future, it just seems like the 800 final will have a fair share of controversy surrounding it. Yesterday my day was chock full of history. I saw it, I read about it, and I experienced it. Being in Berlin is a chance to see firsthand things you’ve only been able to read about in History books…that is if you ever bothered to even read your history books. I can honestly say that there is a lot of history I could stand to have a better grasp on. Which is why coming to places like this is special—I’m seeing with my own eyes places and events that now take on a whole deeper meaning to me. If you don’t mind, I’d like to show you a few of the things I experienced yesterday…I promise it’s a better read than your history book. That’s mainly because it’s not really a read at all…I just want to post a few pictures! 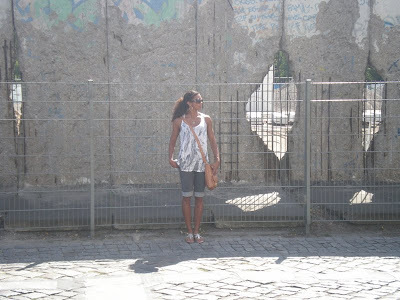 I spent the afternoon learning about, and seeing with my very own eyes, the Berlin Wall and Checkpoint Charlie. 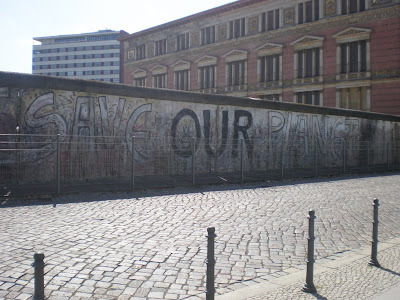 There is still a portion of the wall that exists today as a reminder of what was. 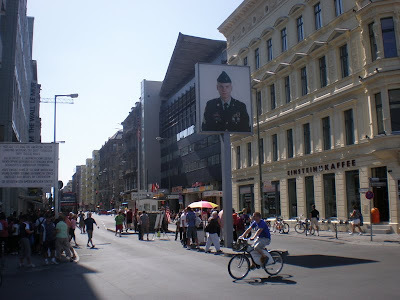 The checkpoint was the only place where you could cross over from the East to the West during the Cold War. While visiting the museum (my friends will be thoroughly shocked by that), I was able to read about and witness the incredible lengths people went to trying to escape over the wall. Later that night I went to the track to experience a different type of history. The 1936 Olympic Stadium has an extremely important history of it’s own, but I’m going to save that for another post. 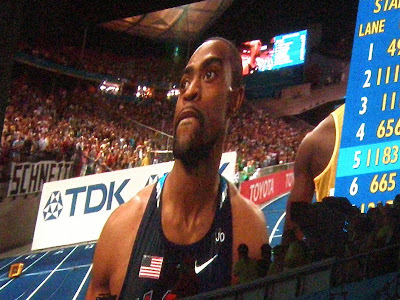 I went to the stadium last night because I knew the 100-meter race would be special, and it did not disappoint. I’ve been witness to a few World Records and it’s always amazing to see someone run faster than any human has ever ran before. 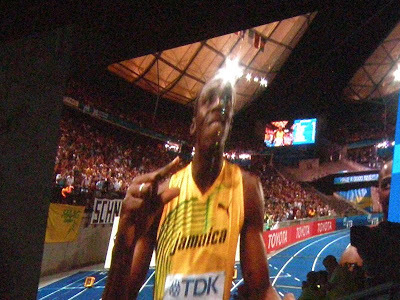 But what Bolt did last night fell into a category that far surpasses anything I’ve ever seen. In your mind you have an idea of what human capabilities are. 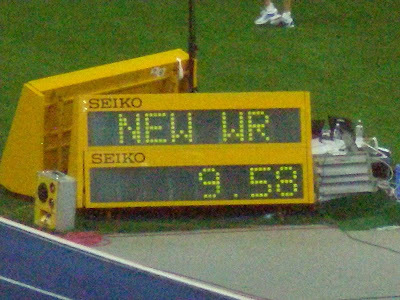 9.58 seemed to go beyond that, but yet, with my own eyes I saw it happen. It’s true that you probably get a much better view when you watch the race on television, but I wanted to be in the stadium to truly experience it. The energy was palpable and there was a thrill and excitement that ran through the crowd that can be replicated on television. There was also an American Record set in that same race. Obviously it will be grossly overshadowed by the out of this world performance turned in by Usain, but when you know the history of your sport, and realize the tradition of phenomenal sprinters our country has produced, you have to still be in awe of the ability of Tyson Gay to run faster than any American has done before. I’m glad I went, but it will probably be the only time I visit the stadium before I compete on Friday. For those of you watching at home on T.V., I wonder if its just as exciting as it is here in person? I sure hope so. I sat in the very front. Front and center to be exact. You know that kid back in school who would sit in the front of class and raise their hand eagerly at every question that was asked? Well that was me today. Total geek. Except I didn’t answer any questions, I just listened and took it all in. Normally I’m not such a nerd. Normally, I would be in the back with all the other cool kids, whispering amongst ourselves and typing on my blackberry while I impatiently waited for the boring team meeting to end. But for some reason it wasn’t boring to me today. Sure, I knew all the information they passed along to us, and spending 2 ½ hours going over information already handed out might have seemed monotonous on any other occasion, but I wasn’t about to let a silly thing like repetitiveness be a damper. The one cool part—even though it took forever-- was all the athletes introducing each other to the group. It’s an awesome thing to be able to meet your teammates, and learn more about people you usually only see in passing. We broke up into groups and had to introduce another team member and share one thing about them the group may not know. I don’t know what is about a group of type A, uber-competitive athletes, but rest-assured our introductions were nothing like what you’ve experienced in previous ice-breakers. So many of them were hilarious! I’m here to enjoy each and every part of this experience. When your journey has been as long and tedious as mine, a 2 ½ hour team meeting seems like heaven, simply because you are in the meeting. 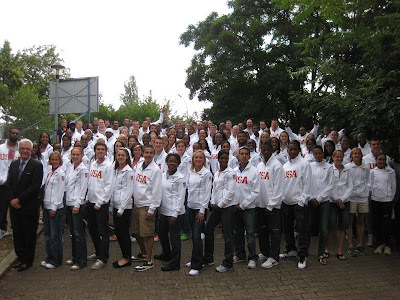 The USA team we have is a great one, and it is an honor and privilege to be able to say that I’m a part of it. Whatever else happens is simply icing on the cake. I say that not to imply that I don’t intend to go out there and shock the world. I’d be lying to say that I’m just content with being here and had no extra goals or desires, but, and this is truly my heart speaking, I want to be proud of this moment and truly acknowledge it for what it is. There are people on our team who have made the U.S. team for 10 and 11 consecutive years, and perhaps for them this type of accomplishment is so commonplace they hardly even blink an eye. But that is not my story. There have been many who accomplish far more than I ever will and there will be even more who hope to accomplish what I have, but for me, making it here is one of my own mountains that I have climbed and I am proud of that. In another 8 days I will have another mountain in front of me that deserves all my attention and focus, but while I’m thinking about it today I wanted to say that I am really happy to be here. No strings attached. Yesterday in the weight room one of my training partners looks at me and says out of the blue, ”Isn’t it weird that you thought you might not even be able to compete this year?” Yes, weird. But also…inspiring. A quick look back through the archives (one of the benefits of blogging, I might add) shows just how unsure I was about this season and my ability to make anything out of it. I was literally taking a gamble, and hoping I could just find a way for my body to hold up and allow me to compete. Jump or Sprint? Either one was fine with me, although I was told sprinting would be the easiest with my current problems. Jump off the right leg or left leg? I've been jumping off the same leg for 15 years, and figured it might be difficult to switch, but I was willing to give anything a try. So jumping it was, off the opposite leg no less, because God is funny like that. I think that is why this season is so special for me. It’s not just the idea of making a team or doing well so far and in the weeks to come…it’s the doing so in spite of the odds against me. And certainly not in the way of proving people wrong who didn’t think I was capable of doing much and should just move on, because that never is my motivation, but continuing to believe when I had plenty of very good reasons not to. In that sense, I feel like I inspire myself in some small way. (Is that even possible?) And this is not giving myself some huge pat on the back, because I will always give glory, honor, and credit where it’s due. God gets it all, it’s merely my job to point out how awesome He is and what a good job He’s doing. But the cool thing about sports, and something I will definitely make use of when it’s time to convince someone to hire me, is that the life lessons you learn are profound and the character traits you build are immeasurable. Yes, I’m participating in a sport, but I’m also molding my character and figuring out what I’m made of. And sure, life is going to teach you that regardless, but sometimes I feel like I’ve been on the fast track. I have always been a confident person but I’ve had to really test that assurance and self-belief over the years, as well as learn how to build it back up. (Which is no easy task, let me tell you.) But when I do look back and see all the low points, it makes me that much more grateful for the high ones. It’s at those forks in the road when you make important decisions and continue to add to you. I look at the me I am now, and compare it with the me I was 10 years ago, and see such a huge difference. Ok, sure, there was going to be differences simply by growing up and disregarding fashion trends that are no longer trendy. But there are still things I can link directly to Track and Field. What I understand about perseverance… how to be resilient… the importance of confidence that does not change simply because of a bad performance… understanding what it means to really want something… knowing what you are willing to sacrifice achieve it… believing in yourself even when you might be the only one who truly does… goal setting… setting new goals once you achieve those ones… desire… living your life so that you have no regrets… understanding that the journey is sometimes far more important than the destination… I could go on and on. But I do know this: when I look back on my life and see the person I am, there will be much that I attribute to these years. It’s inevitable. 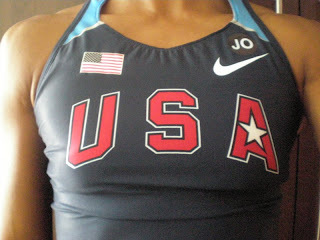 The first time I saw her was back in 2000 at the Olympic Trials in Sacramento. She made an impression for two reasons. For starters, she was white and that always stands out. She also was wearing her own random clothes to compete in. Seriously, who does that?! :) I always try to learn from the best and I guess if I’m figuring out how long I’ve been learning from her it would have to start there. Over the past 9 years she has been my competition, my training partner, and most importantly, my friend. This happens to be an extremely difficult trio of attributes for one person to possess in our line of work. Your competition can at times be successful training partners but rarely can you say that outside of the realm of athletics, you would consider those people true friends. Grace is definitely that to me. A relationship like ours is a tricky balance of a constant desire to be the very best, embedded in the competitors that we naturally are, and at the same time wanting success for the people you care about and who you know deserve it. I’d like to say that we’ve gone back and forth with our successes in the long jump pit over the years, but that really wouldn’t be accurate. She has made every U.S. team since 2003, and I obviously have not. In terms of success, she has me beaten by a mile. 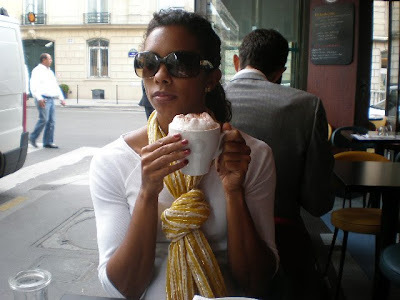 This random girl I first saw back in 2000, who’s name I had never heard of and who’s accomplishments up to that point had been pretty much non-existent, has become the most accomplished long jumper of the last six years. As a competitor and training partner I see what she’s done and I am inspired and perhaps even slightly envious in a non-resentful way, but as her friend I have always proud. Her career has been one of consistency and resilience and I know that she has earned every ounce of success that has come her way. Today Grace left me to head back to the states and begin the next phase of her life, one that does not seem to include jumping in sand anymore. For slightly selfish reasons, this makes me extremely sad. Before she left though, she spent the last couple of weeks being my friend by being my training partner. This happened to be the first time in six years Grace did not make the team and the most unfortunate part was that she totally should have. 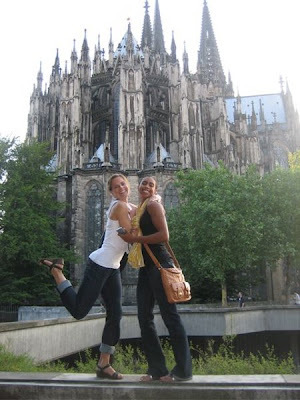 But being the kind of friend she is, after her last meet was over and her career had effectively been put to rest, she stayed in Europe and laced up her shoes every day to do my workouts and support me. If that is not a true friend, I don’t know what is. In fact, if there was a way for me to sum up her character, that story alone would say enough. Grace, this blog is for you because you know by now that I am far better at blogging then I am saying things face to face. 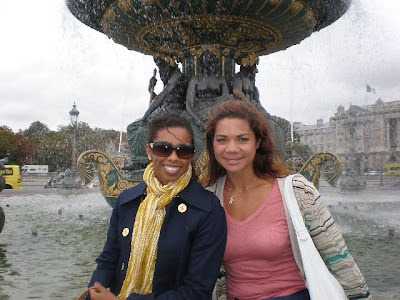 The fact that I am still competing is because of you and your forcefulness and I owe you for that alone. Thank you for everything…for the things you did knowingly and for all the things you did that you never realized had an impact. As an athlete you know me probably as good as anyone and you have always made sure that I continued to believe in myself and my abilities. I will miss your words advice, your opinions on everything regardless if its asked for, your ridiculously heavy breathing when we aren’t even working out, and your unparalleled ability to get people to do things your way. Thank you for being a great training partner (even when you wouldn’t run 120’s with me), a great listener and advice giver, a great shopping buddy who can always convince me to buy, a perfect person to try my sarcastic humor on, and if I haven’t mentioned this already, a truly amazing friend. Our friendship goes far beyond the runway and I know that we will continue to bond in the years to come. I will miss you out on the track every day but I know there is a 5k or half marathon that is calling your name! 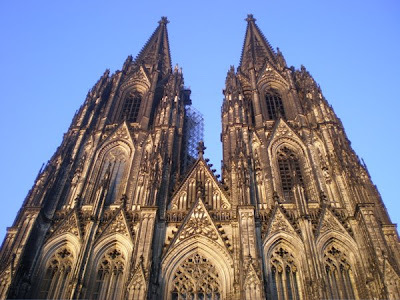 For the past month I have been based in West Germany, in a city named Cologne (spelled Koln, by the locals). 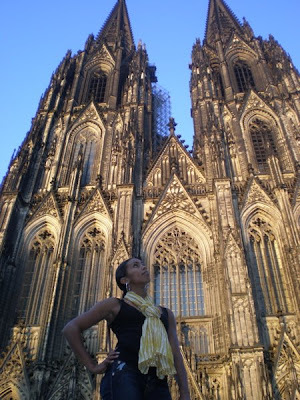 In all my years of travel, I’ve always said that I wasn’t all that fond of Germany compared with other parts of Europe that I visit frequently. 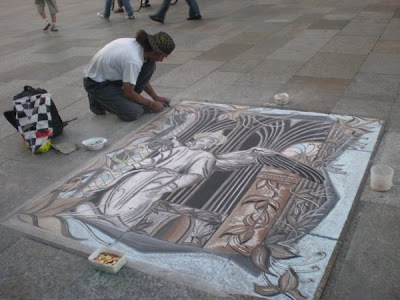 Italy has its amazing food and history, France has beautiful sights and shopping, Switzerland is lovely and picturesque, London has all English-speaking people, Greece has eccentric people and its own fair share of important history, Belgium has waffles and chocolate, and Germany seemed to be able to top none of that. Sure, it has its own share of history…but the part I most readily remember isn’t that favorable and made me look at the country with a bit of a side-eye. But now that I’ve actually spent a considerable amount of time here, I must admit that I pre-judged the place a little too harshly. I actually really like it here. The food has been amazing with an abundance of cute cafés and restaurants that offer far more than Bratwurst to eat, the part of town I’m staying in sits right on the Rhein river and allows for plenty of picturesque evenings, the people have all been friendly and speak enough English to make communicating extremely easy, and the history…is just that. It’s in the past. In fact, this city is extremely liberal and progressive. So, perhaps I’m admitting a bit of narrow-mindedness here in thinking this country was not a place I’d really enjoy visiting and spending time in, but that’s the beauty of being able to travel as extensively as I do and this time around, actually spend a good amount of time here. I now like Germany. It may not be #1 on my list, but it’s cracked the top 20! I had an absolutely dreadful competition in Stockholm, my last competition before World Championships. I’m not sure how many of you actually follow and keep track of such things, but I figured it was worth mentioning nonetheless. I’ve actually had some people wonder if I even competed as I wasn’t present in the competition that was shown. That actually sounded just fine to me. Yes…that’s it…I wasn’t even there! But unfortunately that isn’t the case. And in case you did see the results… no, I did not jump blindfolded, with ankle weights strapped on, or headfirst into a tornado. I simply had a bad day that consisted of one ridiculous jump, two fouls, and a front row seat to watch the rest of the competition unfold. And for me, a wiser piece of advice could not have been given. It is in my nature to freak out when I don’t have things go according to the plan I’ve made in my head. My preparation for Berlin included two standout performances in London and Stockholm, which obviously did not materialize. It is up to me to figure out why and make the proper adjustments. But I also just need to chill out, so to speak. I. Jump. In. Sand. Yes, it is my career, one that is extremely important to me and to which I have sacrificed and struggled a great deal for. But it’s still just a sport. At the end of the year is anyone but me going to remember the awful performance I had in Stockholm? Probably not. And me giving it too much energy is most certainly not going to help me jump far in Berlin. So now I have three weeks to prepare and my goal is simple: Jump farther in sand.